Thanks to its blend of smart looks, sharp handling and efficient engines Mazda’s stylish new supermini has been winning praise from customers and media alike. Voted Car of the Year in the annual Car Dealer Power Awards, the all-new Mazda2 combines Mazda’s unique SKYACTIV technology with its striking KODO: Soul of Motion design philosophy, to bring new levels of technical sophistication, style and driving pleasure to the supermini sector. Now thanks to Mazda’s latest finance offers, it’s even easier to drive away in this high-quality and great to drive supermini. 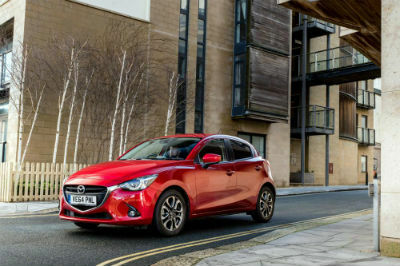 With a choice of 11 petrol and four diesel variants, the 15-strong all-new Mazda2 line up is available from £11,995 OTR and with Mazda’s latest summer offers you could enjoy the all-new Mazda2 from just £139 a month with Mazda Personal Contract Hire. Opt for Mazda’s Personal Contract Purchase (PCP) offers and you benefit from 3.9% APR^ Representative with a £1,000 Mazda Deposit Contribution. Alternatively, with a 50% deposit Mazda’s attractive 0% APR~ Conditional Sale offer gives consumers a further way to finance their vehicle. Across the range, the all-new Mazda2 sets new standards in the B-segment for infotainment, in-car connectivity, specification levels and available safety technology - including Lane Departure Warning System (LDWS), and Smart City Brake Support (SCBS), which automatically applies the brakes if the system detects an imminent frontal impact (Not available on 75ps SE and 75ps SE-L models). Additionally, the optional Active Driving Display with head-up technology, which is available as part of the safety pack on 115ps Sport Nav, projects the most important real-time driving data directly into the driver's forward field of view. Depending on model, available equipment includes: smart keyless entry, climate control air-conditioning, a 7-inch colour touch-screen, a rotary Multimedia Commander infotainment control, MZD- Connect, DAB radio (for the first time in Mazda2), and a satellite navigation system with three years of free European map updates. Customers can select their all-new Mazda2 from five regular grades – SE, SE-L, SE-L Nav, Sport and Sport Nav across a line-up that features four 90ps SKYACTIV-G Petrol models with a six-speed automatic transmission. Optimised ultra-efficient SKYACTIV 1.5-litre powertrains enable buyers to enjoy 75, 90 and 115ps petrol and 105ps diesel engines. These engines deliver an ideal balance of lively, agile performance and highly-competitive fuel economy with CO2 emissions from as low as 89g/km and fuel economy up to 83.1mpg (105ps SKYACTIV-D diesel) and 105g/km, 62.8mpg (90ps SKYACTIV-G petrol manual).